Thumāma b. Uthāl had killed some of the Companions and even attempted to assassinate the Prophet (ṣallAllāhu ‘alayhi wasallam). Eventually, he was captured by Muslim patrolmen as he journeyed to Makkah and was brought to Madinah, where he was fastened to a column in the Prophet’s mosque for three days. When the Prophet (ṣallAllāhu ‘alayhi wasallam) discovered that Thumāma himself – the chief of Banu Hanīfah in al-Yamāma (Persian Gulf) – had been apprehended, he became hopeful in him becoming Muslim and subsequently his entire tribe following suit. May Allah be pleased with Thumāma, and salutations and peace be upon the Prophet who transformed a ferocious persecutor into a compassionate servant of God. Among the lessons of this hadith is how ludicrous a notion it is that Islam was spread by the sword. Had the Prophet been sent to other than Arabia, perhaps this would be a bit more believable. Aside from the Prophet’s magnanimous preference for mercy over vengeance, consider the Arabs’ commitment to stubbornness and pride. Thumāma refused to beg or apologize to save his life, but rather said I have blood on my hands so go right ahead if you wish. Thumāma also refused to ask to be spared unconditionally, but rather said I am a proud chief that can make sparing my life lucrative. Thumāma also refused to embrace Islam while captive, or even upon being untied, but rather waited until he walked out, washed and groomed himself, then returned on his own accord and after refreshing his dignified-chief appearance. A people like this could never be coerced into Islam, at least not the physical violent coercion that may first come to mind. As for feeling ethically compelled by the Prophet’s character, or emotionally compelled by the Prophet’s magnetic personality, or pragmatically compelled (at first) by the Prophet’s tangible accomplishments, these all happened without question. 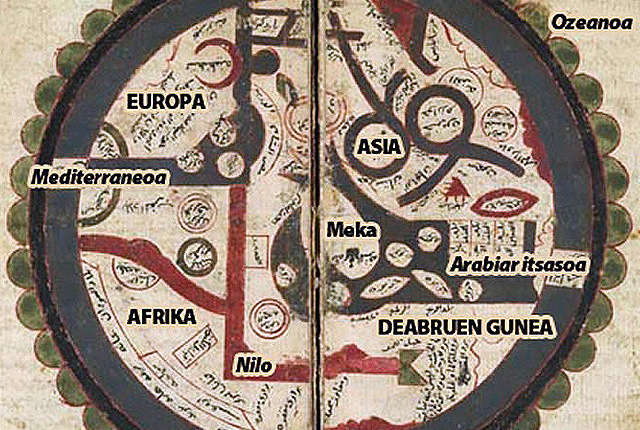 image: Ibn al-Wardi World Map 14th Cent. Previous Previous post: On Praying : Why Bother?